It's been 10 months now since we moved to the country, but I still have no curtains. And that's because I don't want to loose any light or the gorgeous views, and because I'm cheap. In the cubby hole that is my office, I haven't got a curtain either, and this is becoming a problem. Because whenever the sun is joyfully shining, I can hardly see a thing on my computer screen. Usually I put this big carboard poster of Jesus against the window, but even Jesus can't totally block the sun. So there I was, wringing my hands, wondering what to do without spending a lot of money. Then suddenly in a flash of brilliance it hit me: I would tie a piece of rope across the windowsill, and throw a piece of fabric over it. You can see the result in the picture! It just goes to show: if you're neither handy nor rich, you gotta be inventive. 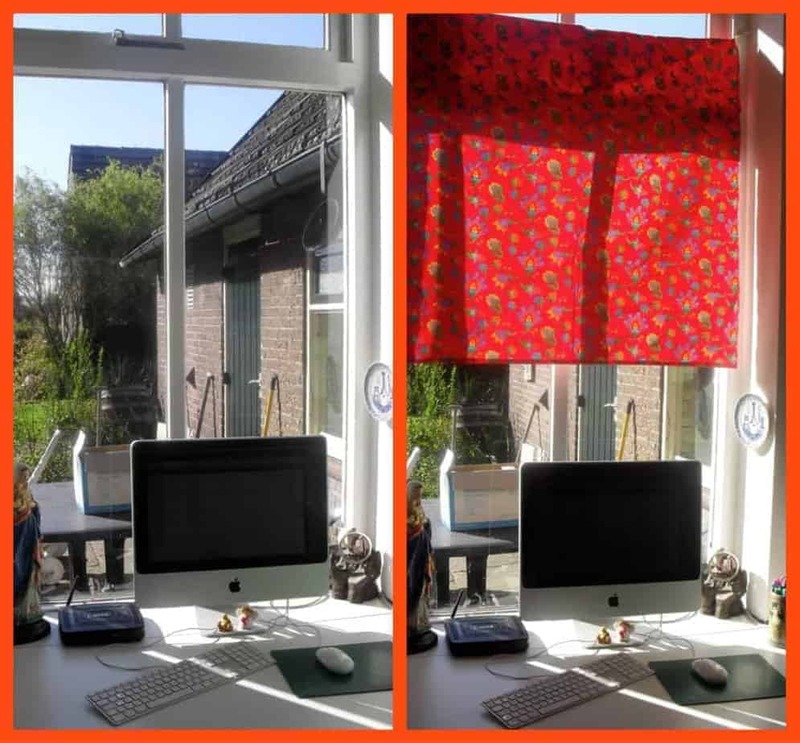 Do you have any ideas for cheap alternatives to curtains? Cute and economical. Love it! The fabric is great...so light and cheery! Nice work! We could still use some curtains... I need to get around to it first though! almost all the curtains in my house are white, I hate to block out any light ever. But, I have used curtains as a shower curtain before and that turned out pretty cute. We have one room in the house that I just can't get right (curtain-wise), the dining room. I have gone through two sets of curtains (took them back to the store because I didn't like them up), and still have nothing but blinds up there. I'd maybe like to try those cute window boxes...but if I hate them I can't take them back to the store, lol.